Nonmetallic mineral resources of the region are of great industrial importance. Within the Baikal basin there are deposits of mining-chemical, thermo-chemical, and optical raw materials, construction materials, mineral fertilizers, ornamental and precious stones. Deposits of raw quartz belong to strategic types of mineral resources. The region has a large raw materials base explored and prepared for industrial development: there are deposits of especially pure granular quartz (Chulbonskoe, Nadyozhnoe, Goudzhekitskoe, and others) and quartzites (Cheremshanskoe and Goloustenskoe). 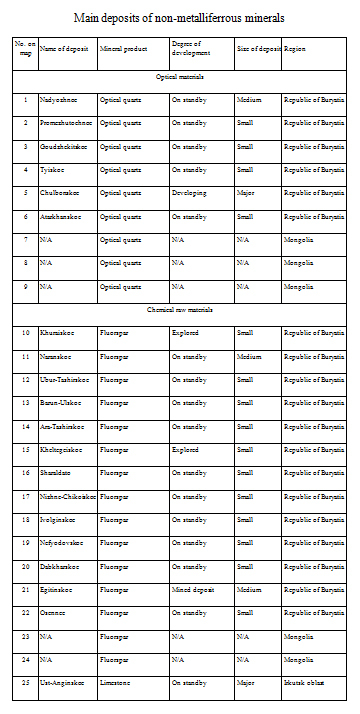 The vast majority of deposits are located in the territory of Buryatia; there are all prerequisites for creating a large complex of plants for deep processing of raw quartz for high-tech industries. In prospect, the republic can become the largest producer and exporter of polysilicon and total energy systems. Currently, there is a development project of the Chulbonskoe granular quartz deposit in the Severobaikalsky municipal district to get the end-product in the form of photovoltaic systems. Quartzites of the mined Cheremshanskoe deposit are of exceptionally high raw materials quality meeting industrial requirements for the production of industrial silicon, silicon carbide and ferrosilicon; in recent years, research is carried out on the purest varieties to produce high-purity silicon for helioenergetics and growing of single crystals of piezoelectric quartz. The deposit has been mined since 1992 by ZAO (Closed Joint Stock Company) “Cheremshansky quartsit” with an annual output of about 200 thousand tons and is a mineral resource base of ZAO (Closed Joint Stock Company) “Kremniy” of the OK (United Company) RUSAL, one of the most cutting edge silicon production facilities in Russia and the country's only producer of refined silicon . Quartzites of the Goloustenskoe deposit can be used in metallurgy, and in the production of silica bricks. Sources of high-quality abrasive raw materials are microquartzites of two large deposits, located in the Olkhonsky municipal district on the eastern slope of the Baikal Range, namely, Srednekedrovoe and Zavorotninskoe. The latter was developed from 1975 till 1993 by “Baikalkvartssamotsvety”; currently, the deposits are on the governmental standby. 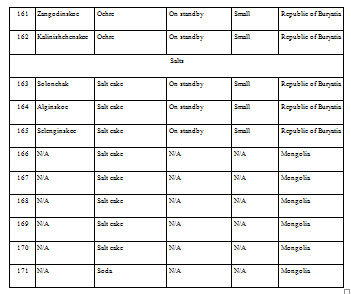 Considerable reserves of raw fluorspar were explored in the Baikal basin in the Republic of Buryatia. Currently, one deposit is mined here. It is the medium Egitinskoe deposit in the Eravninsky district; extracted ore is processed at the ore-dressing plant of the Zabaikalsky mining complex. The Naranskoe deposit in the Selenginsky district was prepared for operation and was mined for some time. The Kyakhtinskaya fluorspar factory operated near the settlement of Khoronkhoy from 1966; first it worked on local raw materials, and then on raw materials imported from Mongolia. Currently, the factory is out of operation. The region possesses large reserves of chemically pure limestones: in the Olkhonsky municipal district there is the Ust-Anginskoe deposit, and in the Zaigraevsky district there is the Bilyutinskoe deposit developed for the production of calcium carbide and the Tatarsky Klyuch for the paint and coatings industry. Dolomites of the Tarabukinskoe deposit are used as a raw material for glass and metallurgical production. Deposits of phosphate raw materials are known in Cisbaikalia. They are the Sarminskoe phosphorite deposit in the Olkhon municipal district and the Slyudyanskoe apatite deposit in the Sludyansky municipal district; in northern Mongolia large reserves of formation phosphorites in the Khovsgol phosphorite basin were discovered and previously explored. The main deposits of the basin are located in the immediate vicinity of Lake Khovsgol, which is an obstacle to their development. The large Oshurkovskoe apatite deposit is prepared for exploitation near the city of Ulan-Ude. On the basis of the approved ready reserves the Zabaikalsky apatite plant was under construction; it was closed down at the building phase of an ore-dressing plant because of possible deterioration of the environmental situation in the Baikal basin. Currently, there is a project of the deposit’s development based on environmentally friendly technologies for the extraction and beneficiation of ores. Taking into account a sustained deficit of phosphate raw materials in the country, an increase of the raw materials base for the production of phosphate fertilizers is a matter of economic security of Russia. The planned standard of production of apatite concentrate is 500 thousand tons per annum. Breakstone will be produced as a by-product in the same amount of 500 thousand tons per annum. Considering the ceramic and fire-resisting raw materials, deposits of Irkutsk oblast should be pointed out. They are the Naryn-Kuntinskoe microcline pegmatite deposit, developed earlier for the needs of the “Sibfarfor” factory, the Kharginskoe glass sands deposit, on the basis of which the Taltsy plant was established in 1784 producing a variety of glass products for 170 years, and the Asyamovskoe deposit of wollastonite, a relatively new kind of mineral products with a number of unique properties and a growing range of applications. In the south of Buryatia a sillimanite (high-alumina) shales deposit named Chyornaya Sopka is known; its ores have simple mineral composition and are easily dressed. On the basis of the deposit a non-waste production with the release of sillimanite and quartz as commercial products can be created. All the above mentioned deposits are currently on the governmental standby. Phlogopite mica deposits in the south of Lake Baikal have been known since the second half of the 18th century. Its regular commercial production using a ramified system of underground (tunnels, mines) and open (open pits) mine openings began in 1924 with the development of the electrical engineering industry in the country and lasted until 1973. From four to seven thousand tons of high-quality raw materials were mined annually in the Sludyansky district. Graphite is represented in the region by two large deposits, namely, the Bezymyannoe (the Slyudyansky municipal district) and Boyarskoe (the Kabansky municipal district) deposits. Ores of the Bezymyannoe deposit are high quality and free-milling according to the manufacturer's tests, but the deposit is located in close proximity to Lake Baikal. The Boyarskoe deposit has the largest reserves. Economic efficiency of its development in compliance with all environmental requirements can be quite high despite low average graphite content in the ore, thanks to its favorable transportation and geographical location. In the past, a considerable part of the Baikal basin experienced intense volcanic activity, the product of which is pearlite deposits, among which the largest ones are Mukhor-Talinskoe, Zakultinskoe, and Kholinskoe. Currently, this raw material is produced by OAO (Joint Stock Company) “Perlit” on the Mukhor-Talinskoe deposit with the production output amounting to 1-10 thousand m3 of raw material per annum over the last three years. The Kholinskoe pearlite and zeolite deposit is located on the border of the Republic of Buryatia and Zabaikalsky krai; the mining OOO (Limited Liability Company) “Kholinskie tseolity” develops the deposit. Nowadays, the capacity of the company mining such a valuable kind of mineral product as zeolites is small and amounts to only about 0.8 thousand tons. Within the region there are a number of deposits of precious and ornamental stones. In Zabaikalsky krai, ZAO (Closed Joint Stock Company) “Turmalkhan” develops a unique deposit of jewelry tourmaline, which is the only one in Russia to date. In the Republic of Buryatia, OOO (Limited Liability Company) “Kaskad” exploits the Khargantinskoe deposit with an annual production of 20 tons of raw jade; ZAO (Closed Joint Stock Company) “MS Holding” started to develop the Khamarkhudinskoe jade deposit, where 510 tons were produced in 2012. To meet the needs of the construction industry the region possesses significant resources of mineral construction materials: numerous deposits of cement, brick, sand and gravel raw materials, building and facing stone are explored in the area. The raw materials base of the Angarsky cement plant is the large Slyudyanskoe deposit of cement marbles, being developed by the OOO (Limited Liability Company) “Karyer Pereval” with an annual output of about 900 thousand tons. The Tarakanovskoe deposit of cement limestone and Timlyuiskoe deposit of loam supply the Timlyuisky cement plant with raw materials. OOO (Limited Liability Company) “Timlyuitsement” produces 250-400 thousand tons of limestone and 20-35 thousand tons of loam annually. Facing stone deposits are located on the western and south-eastern shores of Lake Baikal; they are Burovshchina and Novo-Burovshchinskoe deposits of pink marbles and Buguldeiskoe deposit of highly-ornamental statuary marble of various color shades: from snow-white to smoky-gray. Currently, stone is not produced on any of these deposits. Among building stone deposits AO (Joint Stock Company) RZhD exploits two: one of them is the medium Angasolskoe deposit in Irkutsk oblast and the other is the large Zhipkhegenskoe deposit in Zabaikalsky krai forming the raw materials base of the same-name crushed stone plants. Several deposits of building stone are situated in the coastal zone of Lake Baikal, namely, Baikalskoe, Ermolaevskoe, Dinamitnoe and others, rendering their development impossible. The following deposits of brick and keramzite claysand loams were discovered: the Murinskoe and Khuzhirskoe deposits in Cisbaikalia and Irkaninskoe deposit in the Severobaikalsky municipal district, deposits of sand-gravel mix, including the Utulikskoe deposit of high-quality raw materials, the Pankovskoe deposit of building sands, and so on. Among other mineral resources of the region, the Zangodinskoe and Kalinishenskoe deposits of mineral paints, Khayanskoe deposit of drilling clays, several deposits of raw materials for stone casting, as well as deposits of mineral salts (sodium sulfate) should be mentioned. All deposits of these raw materials are small in terms of reserves and are on the governmental standby. In Mongolia small deposits of asbestos, gypsum, graphite, talcum, magnesite, bentonite, ornamental stones (nephrite, serpentinite, lapis lasuli, ophicalcite, chalcedony, etc. ), raw quartz, and mineral salts are known within the Baikal basin. As for construction materials there are deposits of building sand, brick, keramzite and ceramic clays, sand-gravel mix, building stone, etc. The map presents the main nonmetallic mineral raw materials deposits, depending on their size and type of mineral product, as well as mining companies using symbols. The size of the symbol designating a company depends on the average production output over the recent three to five years or on the planned capacity of the objects designed and under construction; gradation is presented in the summary table. 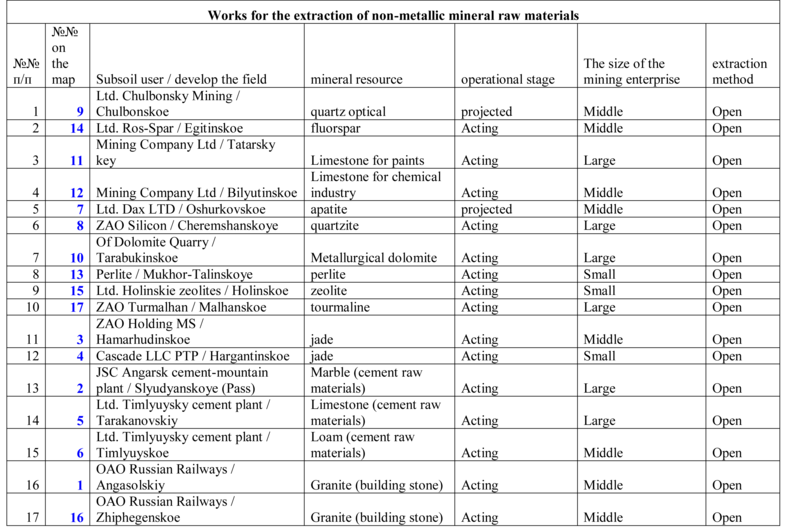 The color of the symbol corresponds to the operational phase of an enterprise. The Khubsugulsky phosphorite basin is shown with an areal. Map construction required the use of the materials of the Regional Funds of Geological Information, maps of mineral resources of the A.P. 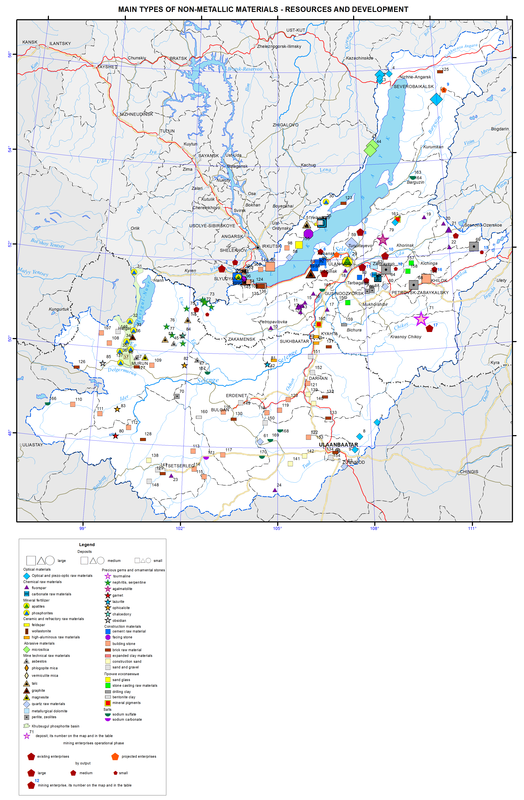 Karpinsky Russian Geological Research Institute; materials of State Reports “On the Condition of Lake Baikal and Measures of its Protection” for 2010–2012; “National Atlas of the Mongolian People's Republic” (1990), “Atlas of Mongolia” in the Mongolian language (2010), and “Atlas of Socioeconomic Development of Russia” (2009). 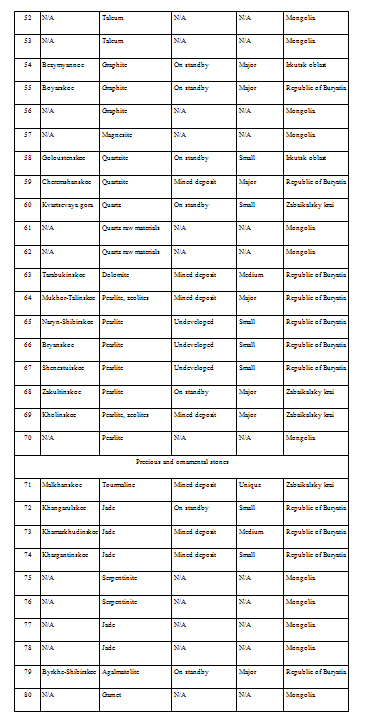 Information on deposits according to the types of raw materials and on mining companies is presented in the summary table.